Within the space of a week some sad events have taken place on the K&A. 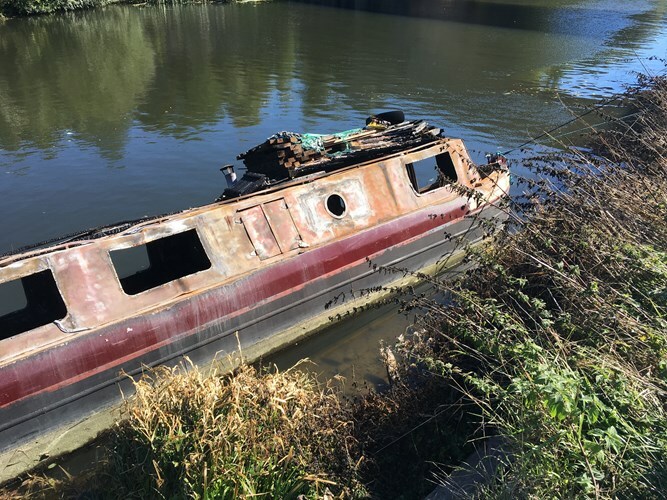 Over the weekend of 21st to 23rd September a historic boat was sunk by speeding stag party hire boats rendering its owner homeless, and on 22nd September a boat fire on the River Avon put a liveaboard couple in hospital with severe burns; their boat has now sunk. Later last week, liveaboard Jeff Green was found in the canal at Semington. He lived on an aluminium lifeboat at Semington Dock where he had also worked until recently. Jeff was a popular and friendly regular in the nearby Somerset Arms. His funeral will take place at Worthing Crematorium on 22nd October at 10.40am. There will also be a celebration of Jeff’s life at the Somerset Arms on 22nd October starting at 5pm; his family and friends extend a welcome to all who wish to attend either. Friends and fellow boaters with help from a CRT work boat crew have now succeeded in salvaging the historic narrowboat Celtic’s Lister engine and in raising the boat, though this took over a week of sustained effort, with people lending pumps and equipment. And thanks to the generosity of the community, the appeal to help George repair his home has raised just over £9,000. Our community has shown itself to be kind, generous, resourceful and resilient in many ways in its response to these sad events. This entry was posted on Thursday, October 4th, 2018 at 8:51 pm	and is filed under Community. You can follow any responses to this entry through the RSS 2.0 feed. You can skip to the end and leave a response. Pinging is currently not allowed.